about…REDEFINING…..CREATIVITY…..ISM LESSNESS…CHANGE…and FREE THINKING ! 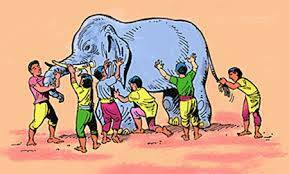 They conclude that the elephant is like a wall, snake, spear, tree, fan or rope, depending upon where they touch. They have a heated debate…..
And all were in the wrong. ~ by bhaskarbenjamin on April 11, 2017. Corporat Social Responsibility and You ! CROSS WORDS AND ENTER THE LAND OF UNDERSTANDING ! LET US CHANGE SCHOOLS….my other blog ! LET US RE BELL THE CAT ! bhaskarbenjamin on Corbett national park : alarm calls : wake up… those who are either paid to look after…..or simply care ! Corbett National Park on Corbett national park : alarm calls : wake up… those who are either paid to look after…..or simply care ! bhaskarbenjamin on Corbett National Park….is it under a threat ?